Early morning arrival in Uganda’s Entebbe International Airport. Meet and assist by Trails of Africa Safaris airport representative and after safari briefing, we start our journey to Bwindi-south western Uganda starts, on Masaka Mbarara road via the fascinating Kigezi highlands and arrive in Kisoro late the evening.Overnight at Gorilla Resort Camp/Lake Kitandara a Camp/Buhoma Community Rest Camp booked on Full Board: Lunch/Dinner/Breakfast. Early in the morning after breakfast transfer to Lake Mburo NP via Queen Elizabeth NP having your lunch en route in Mbarara town. 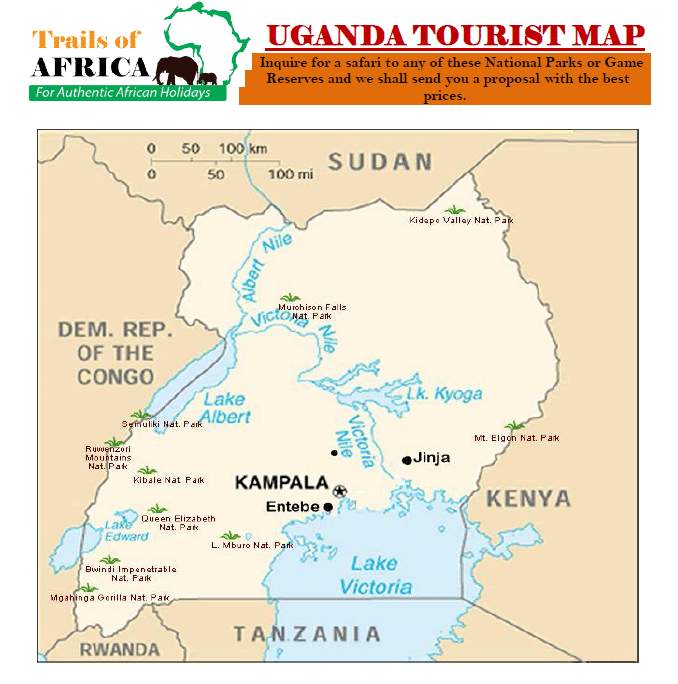 Proceed to Lake Mburo national park for an evening boat cruise on arrival or a game drive if preferred. Whichever you choose, be assured of seeing a variety of game and birds the difference is that one is on water well as the other is on land.Overnight at Basic Rwonyo bandas/ Mantana Luxury tented Camp booked on Full Board: Lunch/Dinner/Breakfast. After your early morning breakfast, you will undertake a nature walk-the most interesting nature walks in the country that will expose you to various species of primates, birds, antelope, buffaloes and many wild plant species. After this, proceed to Kampala but stop-over in Lyantonde for your lunch or at the Equator where you can buy African crafts and take photographs.You will arrive late evening in Kampala, dine and spend your overnight at or similar other.Overnight at Speke Hotel booked on Full Board: Lunch/Dinner/Breakfast. After breakfast at around 9.00 am, your guide will pick you up from your hotel and you embark on the famous Kampala tour.You will penetrate the busy capital city and tour all the gothic era cathedrals, mosques, the Bahai temple, Namugongo shrine-where the famous Uganda Martyrs were murdered, visit the famous Owino market down town, Kabaka`s palace and lake, Kasubi tombs, Uganda parliament etc.Return to your hotel/Lodge or if you wish transfer to the airport for you flight back home.